A Practical Guide: How do I network vSAN Ready Nodes? Home » White Papers » How Do I Network vSAN Ready Nodes? How Do I Network vSAN Ready Nodes? This is the first entry in a five-part insideHPC guide series that explores networking with Dell EMC ready nodes. This post outlines how to network vSan ready nodes. 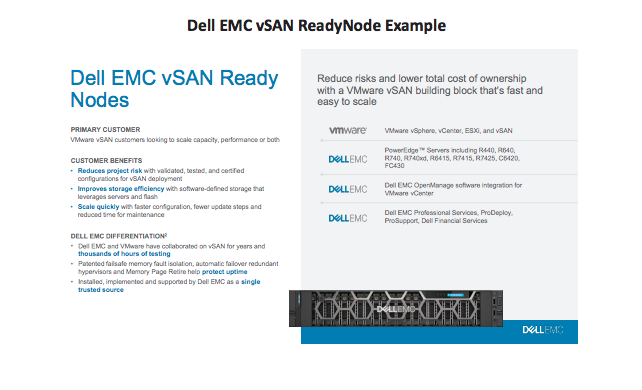 Dell EMC vSAN Ready Nodes are built on Dell EMC PowerEdge servers that have been pre-configured, tested and certified to run VMware vSAN. Each Ready Node includes just the right amount of CPU, memory, network I/O controllers, HDDs and SSDs for VMware vSAN. VMware vSAN is Software Defined Storage (SDS) that leverages a distributed control plane abstraction to create a pool of storage from disparate server-based disk hardware. That abstraction is comparable to the way the vSphere ESXi hypervisor converts a cluster of server hardware into a pool of compute resources (VMs). As an integrated feature of the ESXi kernel, vSAN exploits the same clustering capabilities to deliver a comparable virtualization paradigm to storage that has been applied to server CPU and memory for many years. Each physical host in a vSAN cluster, can consist of three to 64 hosts (as of vSAN 6.6), contributing direct attached storage to a Disk Group in the aggregate storage pool. A hybrid vSAN deployment consists of physical servers that have both spinning disks (HDD) and solid state drives (SSD/flash) to accommodate tiered storage deployments, with the SSD reserved for intense read and write operations. There are also all-flash deployments for particularly demanding workloads, where sequential read/ write transactions are dense and associated HDD latency is intolerable. vSAN SDS is an extension of hypervisor-based virtualization. vSAN follows the same operational model for provisioning storage that vSphere uses to provision virtual machines. vCenter Server acts as the common management point for both vSAN and ESXi. In a vSAN environment, when a virtual machine is created, the administrator is asked to assign a previously-configured storage policy that reflects an application’s performance and availability requirements. The policy that is applied to the workload is all that is needed with regard to storage provisioning. There is no need to manage Logical Unit Numbers, or configure masking or zoning, or set RAID levels. All the details and mundane tasks typically required in a legacy, non-software defined storage deployment are relegated to the vSAN software, which provides centralized management and hardware abstractions that place the burden of executing the policy’s requirements on the software and away from the hardware. How do I network Dell EMC Microsoft Storage Spaces Direct Ready Nodes? Download the full report, “A Practical Guide to Networking Dell EMC Ready Nodes,” courtesy of Dell EMC, to learn more about Dell EMC Ready Nodes and Microsoft Storage Spaces Direct Ready Nodes.